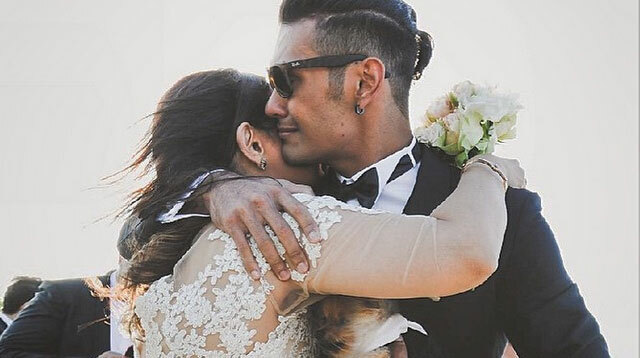 Let's Talk About Gab Valenciano And Tricia Centenera's Wedding! These guys gave us some serious relationship goals. (And also, ideas for our dream wedding). Meet Gab Valenciano and Tricia Centenera. Gab is Mr. Super Selfie—and he married girlfriend Tricia on March 28, 2015, at Tagaytay Highlands. This is Gab. He is quite the poser. This is Tricia. Tricia is very hot. Gab arrived at the golf course in a BMW motorcycle. According to his mom Angeli Pangilinan-Valenciano, he was late. LOL! "Caramba. The jeep of @triciacentenera arrived earlier so we had to make a Take Two! Hay Naku." Here's the groom with his dog, Rocket Vee, with mom Angeli, dad Gary, and brother Paolo. Tricia's family members, who flew from Australia, were all decked out in white for the wedding. Those are her sisters Bridget, Emmy, her mom Tina, dad Joe, Christine, Maggie, sister in-law Jennie, and niece Gracie (who looked like a mini-bride, too, in her poufy dress!). P.S. Tricia's sis, Christine Centenera, is the Fashion Director at Vogue Australia. And her off-shoulder gown by designer Rossie Asoulin was flawless AF. When we grow up, we want to be like Christine. Gab's sister, Kiana, looked equally good in a Francis Libiran creation as well! Gab's mom Angeli wrote on Instagram, "Releasing a son to another woman is difficult for many but I have found joy in surrendering my sons to the women God chose for them," adding, "And now to detach even more is a challenge and a leap of faith. God blessed us with beautiful, strong, creative & loving women of faith as wives for our sons." Before the couple kissed, they realized they had to...uh, stretch? Because according to Gab, "It's normal for a couple to stretch before they kiss." Of course? There were fireworks at the reception! And celebrity wedding guests! Like Kim Jones, Carla Humphries, KC Concepcion, and Mica Javier. Y'all are both ridiculously good looking and fit and life isn't fair.